Sister, 2000. Lithograph with chine collé on paper (ed. 10/75). 22 x 29 3/4 inches (56 x 76 cm). Gift of the Harry and Lea Gudelsky Foundation, Inc. In 1948, family flees their home in Changchun looking for food when her father is detained by Communist troops- she will not see him again until 1994. Prevented from creating art by the Communist government during the Cultural Revolution started in 1966; for four years, Liu was subjected to proletarian re-education, where she was sent to the countryside to work among peasants. Is accepted in 1981 to University of California, San Diego, but her bid for a passport is refused by the Chinese government; luckily, the university holds her place until 1984 when she is finally able to obtain a passport. While at UCSD, she participates in Happening-type events with Allan Kaprow and meets fellow students Lorna Simpson, Christine Tamblyn, Hal Fisher, and Jeff Kelley. In 1986, marries Jeff Kelley and her son moves to the United States; the two become U.S. citizens five years later. Liu returns to China for the first time since leaving, only to discover early 20th century photographs of Chinese prostitutes that she incorporates in her imagery. Participates in a variety of group shows, including 43rd Biennial Exhibition of Contemporary American Painting at the Corcoran Gallery of Art and American Kaleidoscope: Art at the Close of this Century at the Smithsonian American Art Museum. The above image, Sister (2000), is a part of NMWA’s collection. For more information and images of Liu’s work, visit: http://www.kelliu.com. Look for a new artist on Broad Strokes every week! About the Artist Spotlight author: Jackie Witkowski will be a senior at DePaul University in Chicago. She is interning for the Education Department and the Library and Research Center for NMWA this summer. This is fabulous! I look forward to more. 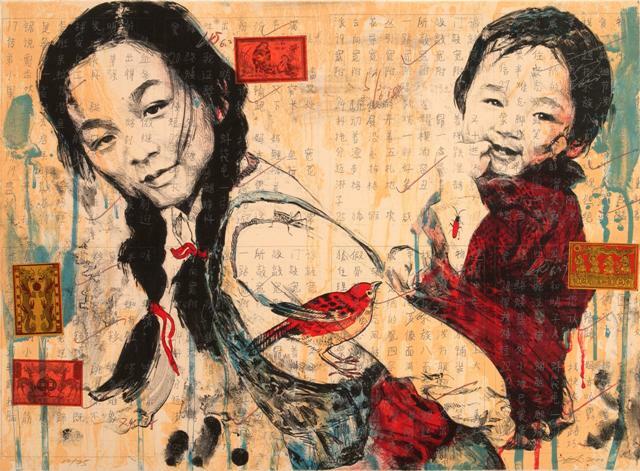 Hung Liu’s art is very engaging and very creative with a handsome background of Chinese Calligraphy. I am referring the the “Sister” lithograph with chine colle.